When I was a little girl, every year on December 1st, we would hang up the flannel board Christmas advent calendar and begin our countdown to Christmas. Each day one of the children would pull out a piece and place it on the board. 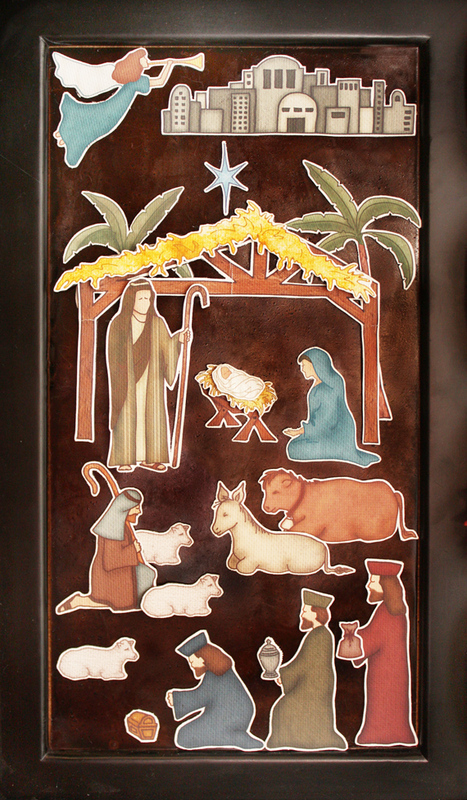 We all looked forward to it and were excited to see the nativity scene fill up, which meant Christmas was close. Now that I have my own children, I wanted to continue this tradition. I have added to it just a bit! 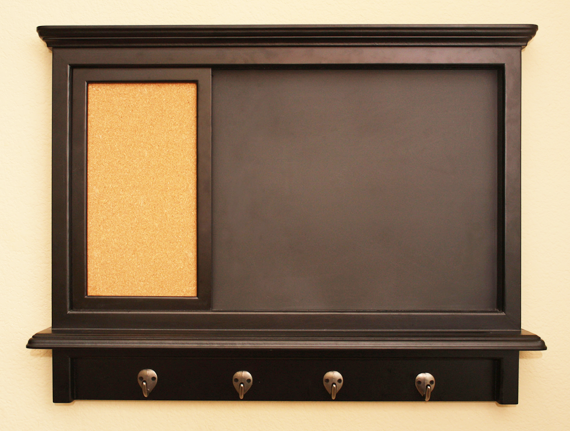 First, I found a really cute magnetic chalkboard at a craft store. Then, I purchased 24 paper mache boxes that fit perfectly inside the framed area. I printed out a variety of holiday themed digital scrapbooking papers from several Scrap Girls kits digital kits. I cut out ovals from the paper, added numbers and decoupage, and a few embellishments to decorate the tops of all the boxes. 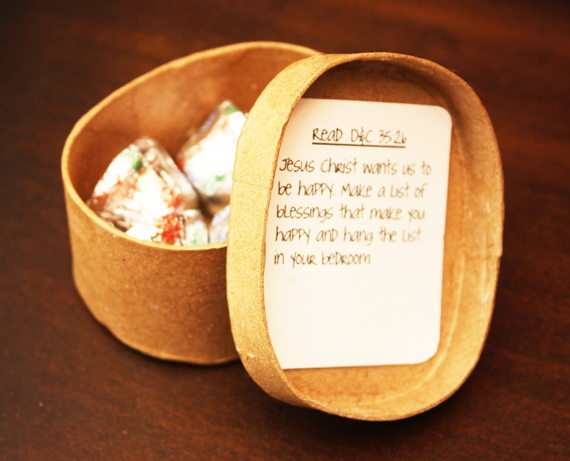 Next, on the inside cover of the lids, I glued a scripture and an activity to be accomplished for the day. Each activity is intended to help us think about and come closer to Christ. A few of the activities include service to loved-ones, scripture reading, journal writing, kind deeds and more. Once the task for the day is completed, a treat can be taken from that day’s box to be enjoyed. Now, for the Christmas Advent Countdown portion of the project! 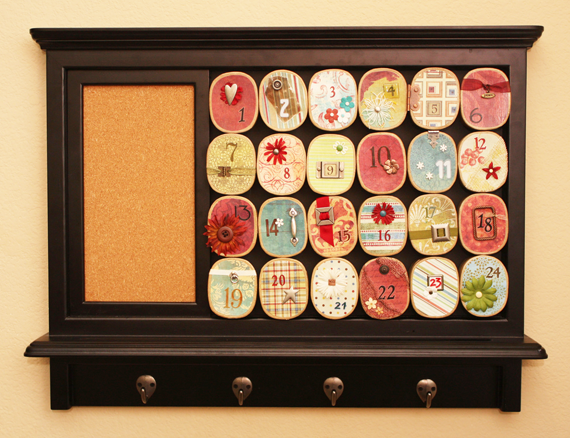 The frame that I found also included a little corkboard, which is the area that I wanted to build my advent scene. I purchased a sheet of craft tin, trimmed it to size and glued it over the corkboard. Then, I printed out all of the advent images from my Assemble Your Own: Christmas Advent set on canvas photo paper and cut them out. Using sheets of magnet, I added magnet to the back of all the advent pieces and trimmed them down. I then placed one advent image inside each box. 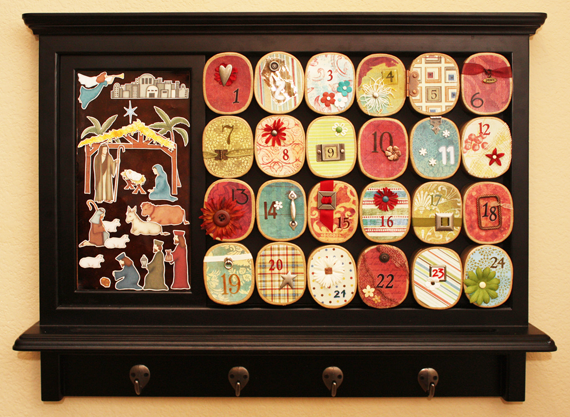 Each morning when a box is opened, the Christmas advent piece is added to the magnetic board before the activity is read. The goal of this project is to help our family remember the true meaning of Christmas. Focusing on the birth of Jesus Christ and giving little gifts to him throughout the month by doing things that he would have us do is what Christmas should be about. This Christmas Advent Countdown helps us to do just that and you can do it too!